In anticipation of our Copenhagen trip this week, I’ve been getting back into overnight oats. I remember the first time I ever ate muesli, on my first trip to Denmark almost 15 years ago. I had never had cold oats before and was initially taken aback by the concept. Like all new things, it’s only weird before you try it. Three bites in, I was immediately hooked though it would take almost a decade before this became a regular breakfast option for me. What is it about the quality of oatmeal (and yogurt) anywhere but America? I remember having the same life-changing muesli experience in New Zealand, then again this past winter in Austria. The oats are almost always denser and creamy than what I find here, especially studded with extra nuts and fruit. Here’s my nod to the meal I know I’ll be eating day after day on this current trip. To get the oats as creamy as I want them to be, I made my own cashew milk base. If you’ve got a blender and a fine mesh strainer, you can make your own milk. And, it needs to be said that homemade nut milk is much, much better than most of the stuff you’ll find in the store. I know it’s an extra step, but it’s worth it. If you don’t wait to use cashews, I think almost any nut would work in it’s place. From there, I added in a bit of vanilla for depth and lavender sugar for an unexpected flavor. I picked up some of this sugar on a recent shopping trip and have been putting just a pinch into muffins, ice cream, pancakes and oatmeal. A little goes a long way, you want just a hint of floral, not perfume. If you don’t have (or want to find) lavender sugar, you can either make your own by grinding culinary lavender and sugar in a spice mill or forgoing it all together. Sure, I love the combo of lavender sugar and cherries together, but it will still be delicious without it. Perhaps add some extra vanilla extract instead. Strain the cashew-lavender mixture using a fine mesh strainer (the easiest way) or a nut-milk bag, then add in the oats. It will look like way more liquid than you need, but the oats will absorb it as they soak. 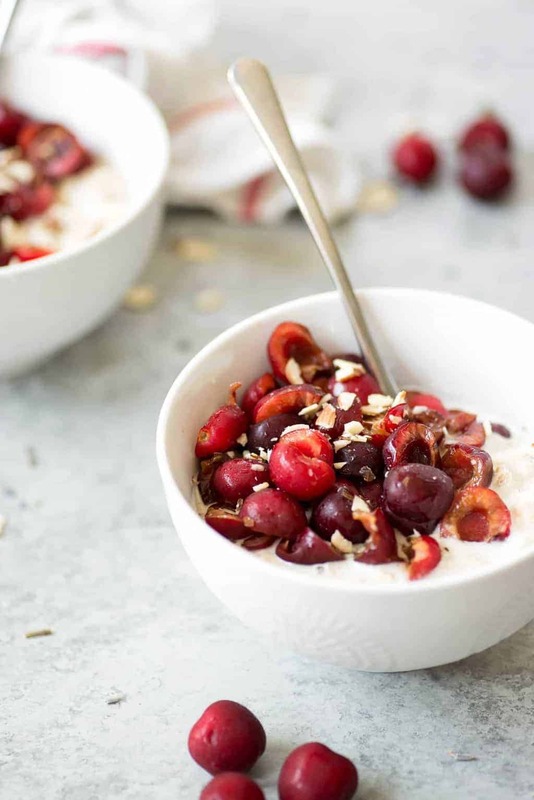 I like my oats pretty creamy and will often make extra cashew milk just to top with in the morning. Place in the fridge overnight to soak, then assemble in the morning. 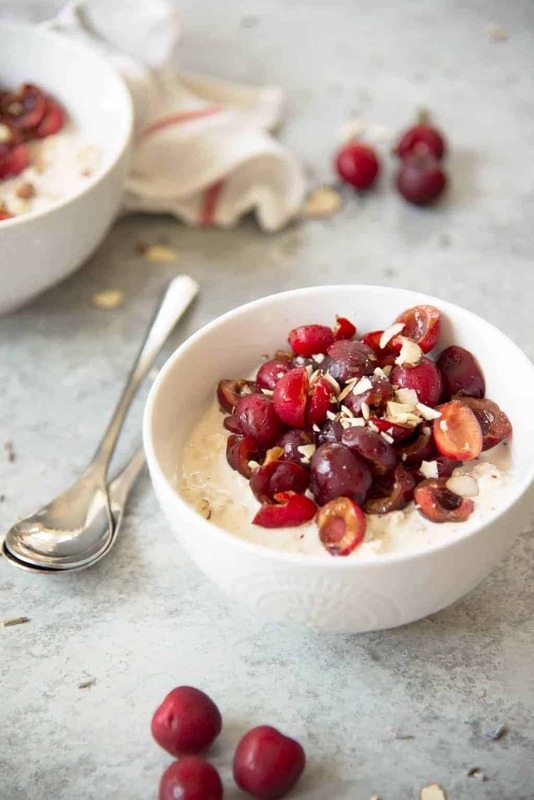 I know that even in season fresh cherries can be a splurge, so again, any berry will work. This is the joy of confident cooking: knowing what you like. If you don’t have cherries, try blueberries or strawberries instead. 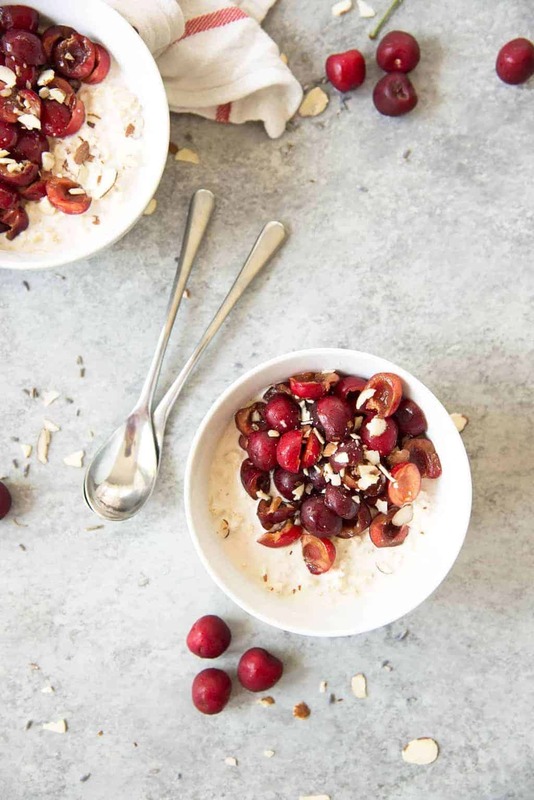 Add some extra nuts for crunch and you’ve got yourself once healthy yet decedent breakfast. P.S.- We’ll be exploring Copenhagen/Denmark through the week and I’ll be posting our adventures, drinks and eats on Instagram stories. Follow along if you’d like! Place cashews and water in a high-powered blender and puree until very creamy and smooth. Depending on the strength of your blender, this may take up to 5 minutes. Add in the lavender, sugar, lemon juice, vanilla extract and a small pinch of salt. Pulse to combine, then strain using a mesh strainer or nut-milk bag. Place the cashew-lavender milk in a bowl and stir in the oats. Cover and place in the fridge and let soak 4-6 hours or overnight. 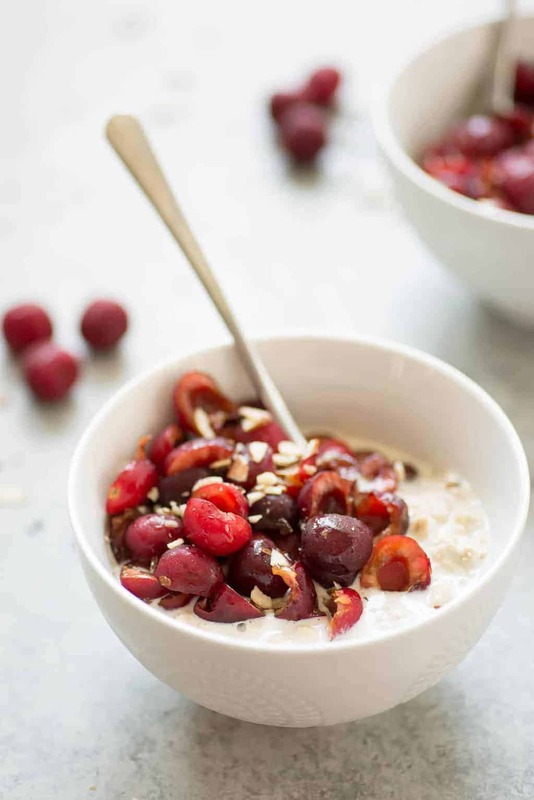 To serve, spoon oats into two bowls and add cherries and almonds. Enjoy! Lavender flavored almond milk?! Sounds amazing! Great idea!